Priscilla Queen of the Desert, the most outrageous and camp theatrical event you will see this year, has arrived in Dartford at the Orchard Theatre this week. With catchy pop tunes, strong all-rounder leads and a wardrobe to die for, the Priscilla tour really is a hot ticket in Dartford this week. Based on the 1994 film, the musical follows two drag queens and a transgender woman as they cross the Australian desert to perform a drag show in Alice Springs. Despite some original differences, the trio find true friendship on their journey despite mechanical issues and homophobic incidents threatening their road trip! From the minute the musical starts the tone is set and you know you’re in for a right treat. As the three divas drop from the ceiling and belt out Petula Clark’s classic hit, Downtown, you are guaranteed a spectacular show. The performance and production level never drops, largely thanks to the incredible costume and wig design and three incredibly strong leading performances. 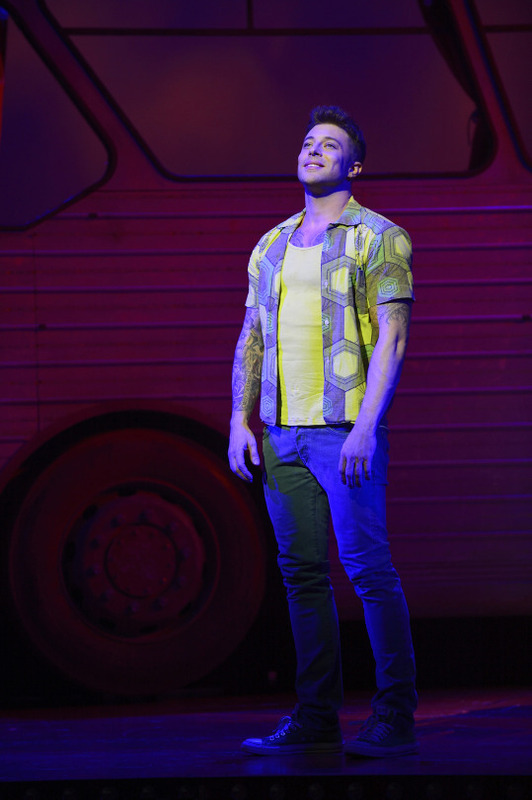 Duncan James steps into the role of Tick with absolute ease. He is confident, likeable and his smooth voice really shines; although I probably was the only one focussing on assessing his voice and not his abs which got wolf whistles throughout the night! Alongside him Simon Green smoothly handles the role of Bernadette with class and sophistication. A standout performer for me was the incredible Adam Bailey who wowed from the minute his heel touched the stage. He is definitely one of those performers with ‘money can’t buy’ stage presence, and that’s before you get to his flawless voice and the effortless ability to create a funny, endearing character in Adam/Felicia. The trio are backed up by a solid, well-choreographed ensemble, particularly Lisa-Marie Holmes, Laura Mansell and Catherine Mort as the three divas, all showcasing powerhouse voices that really bring the house down. The whole production is entertaining and the script is witty, despite the odd joke to make you groan. It doesn’t take itself too seriously but still has a serious message of acceptance, coupled with show-stopping numbers such as I Will Survive and Colour My World. It’s a shame a few things have been cut or amended from the West End production but on the whole it barely touches the quality of it. For a touring production they have achieved a lot and if the audience is anything to go by it completely hits the mark – energetic, slick and totally fabulous! Priscilla Queen of the Desert is showing at the Orchard Theatre in Dartford until Saturday 30th May before continuing its tour of the UK. Tickets are available online from the Orchard Theatre.